You’ve put the Share buttons on your site or installed a basic sharing plug-in. To see if people are using them, you can install a plug-in like Social Metrics or Google Analytics. Social Metrics doesn’t really give you in-depth information, though, and the true social media metrics master wants as much information as possible. The Google+ +1 button already has metrics in it for Google Analytics. Every other Share button needs some tweaking. 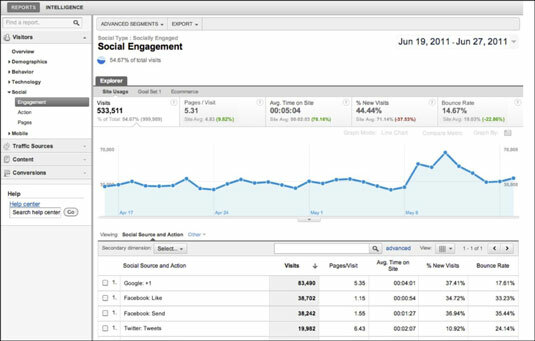 After you install this code in all your social Share buttons, you can track the activity through the Social Engagement Report in the new Google Analytics. This report allows you to see at a glance not only which social platforms your visitors are most engaged in, allowing you to focus on them more in your social marketing, but also helps you find any weak spots. As you track content across social buttons, you can determine which content topics and type of content are most compelling to your visitors and make your site content more engaging and sticky overall.